Our town does only one parade a year, and that's the Memorial Day parade (we have to go to the next town over for the others throughout the year). They also do a tribute to those who have given their lives for freedom and a 21-gun salute. It's nice. The parade this year started off with the military men, and it took all of three seconds for people to stand and clap as they walked and drove by. It was loud, and it was awesome! I was very happy to live here in this town when they did that...it was very heartfelt, very touching, and very well deserved. 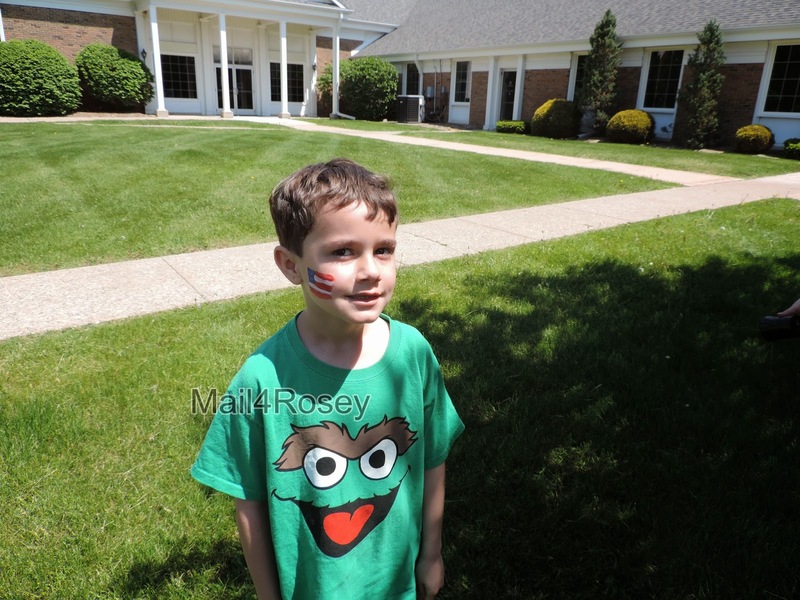 Sporting his American Flag face paint. The rest of the day was spent having fun. There was a bounce house obstacle course, face painting, balloons, etc. Later in the day hubby cooked burgers and hot dogs on the grill and I made the sides. He also told me he saw a survey online that noted 65% of the gazillion respondents said they do not grill out on Memorial Day. I was surprised, I thought it would be way more who said yes. I'm glad we were in the minority for that one, I think Memorial Day (if the weather is nice) is the perfect excuse to break out the BBQ. Back to the grindstone today, but a big hurrah for long, relaxing, holiday weekends! For your city just to have one parade, this is a perfect one to have. It has that full meaning and there is so much we can learn and teach our little ones from memorial day, honoring and giving tribute to does that have gone before us defending our rights and ways of living. It's nice to see that you took advantage of this day and had quality time with your family. Big hurrah indeed, think we need more of those at our feed. Sounds like a great day at your bay. We don't BBQ on Memorial Day. I can't remember if we ever have. I don't thing so. I am right there with you BBQ's are awesome! I am so thankful that we are able to BBQ and feel safe at home or where ever while doing so because of the men and woman who protect us! I know I was grilling out yesterday! I'm not sure if I always do it on Memorial Day, but I sure did yesterday. Delicious! Glad those watching the parade paid honor. Sounds like you had a great day! It was rainy here, so we didn't go to the parade in our town (if they even still had it). We ended up having a lazy day, but hit NYC on Sunday, so a good rest was ok with all of us. We didn't grill out, honestly our grill hasn't seen the light of day in a long time :) My husband needs to sand and re-paint it and he just hasn't been motivated. It sounds like you had a great Memorial Day! What a nice way to spend the day. We did not grill on memorial day. One of the first days this has happened for us. That is very good that your town does this. I wish we had something like that near by. And with the past few days I was soo grateful that it was a holiday too so the kids could relax and get some much needed rest. Sounds like a great parade! We didn't get to ours this year. Sounds like you had a great time,It was nice to have a long weekend for me but i am glad its back to normality now lol. Awww, the wee guy is both handsome AND filled with the spirit! So glad you and yours had a good holiday! I haven't seen a Memorial Day parade in this area for years, which deeply saddens me. Goodness, I haven't even seen folk selling poppies for several years. It's great that you live in a town, plus have a child, with true spirit and the right priorities. Your bbq sounds yummy too - a great Memorial Day, with honor to our troops - you did it right! It sounds like you had a great Memorial Day. Enjoy the rest of your week! Sounds like a great town. And nice that you are close enough to drive to a neighboring one for other parades. It sounds like a most excellent day. It sounds like you have a fun tradition going on. We used to go to Memorial Day Park, but now it's the only day all the families can get together to celebrate the May birthdays. I like celebrating those to. I do miss the park a bit. Sounds like a wonderful time and a great picture! Only 1 parade? That's wild to me, it's probably only crazy to me because I'm from Louisiana, we have parades for everything here. With that being said, it's nice to know your town does a Memorial Day parade. What a great way to get out with your family and teach your children about our country and the men and women who have and are currently serving to protect us and keep us free. I don't think I have ever been to a memorial day parade. I think that is something I may look for next year. It's nice to have a relaxing day with family! I missed our town's parade but hope to catch the next one on July 4th. We stayed home and did some outside work this year on Memorial Day. The husband cleaned out the gutters and I did some cleaning on the patio. We did cook out that evening though. As always, we remember those fallen on Memorial Day. My dad and brother are both Marines and I'm thankful that they're with me every day. Sounds like a fun day. We barbecued... in the rain. It was great fun. I think you had a great day - love Oscar's shirt - I remember Sesame Street! We missed the parade here because I was sooo tired after two long days at Cedar Point. We didn't even invite anyone over, but Jason and I did burgers on the grill just for us. Earlier that day we were driving to the next town over and I pointed out to the hubs that I didn't smell one grill going. What is up with that!? 65% of people have it all wrong lol. My city does a parade for every holiday or non-holiday! Now that I think about it- they did not do one for memorial day... odd! Sounds like you had a great day. I'm glad your town has a Memorial Day parade - so much fun! I'm glad you had a good weekend. We usually do grill on Memorial Day, after any ceremonies or parades we go to to honor the real reason behind Memorial Day. so glad you all had a happy memorial day! the parade sounds like a lot of fun! love the flag face painting! pippy got her first "paint" this weekend...she loved it! I hope you have a wonderful week, rosey! What a wonderful Memorial Day! We watched a parade too! It was so great having that extra day off, wasn't it? I think it's great that your son already has a since of pride about our country! Thanks for sharing your wonderful town with all of us! Sounds like such an awesome parade. Thanks for sharing. In our area, there was a Memorial Day parade and my daughter got to film it for the local PACTV station. Sound like a lot of fun you have in town! We have Pride Week the week before Memorial Day with a parade too. My niece marched in the Memorial Day parade in Rochester, NY this year. It was so special to watch her! Our town only does the 4th of july so I know what you mean about traveling to the next town over. It seems like you guys had fun though! Sounds like a wonderful day. It was a perfect mesh of honoring the day and having some family time! sounds fun. we had a nice bbq at home. sounds like your family had a great Memorial Day. We definitely grilled that day and had a wonderful day! Sounds like y'all had a great memorial day!!! We spent ours at the beach. It sounds like you had a great time! I can't believe more people don't cookout! My husband grilled on Memorial Day this year. He doesn't always, it just depends on what is going on. We went to a BBQ on Sunday as well. I love Memorial Day - not just because it is a long weekend, but because of the meaning behind the celebration. It sounds like you and your family had a wonderful day!